Tantra breathing, deep reconnection with yourself and the universe, cellular memory cleaning. Sit down or lie down and enjoy the sound ! Let the waves heal your body and your soul. Effects : physical and emotional tension release. Body and mind cleaning and readjustment / balancing. Langage : will be bilingual japonese and english or Japanese and french. From 12:00 to 17:00 ! If you wish to join the vent whenever you wants a healing or not, please confirm your presence with me, thanks you! 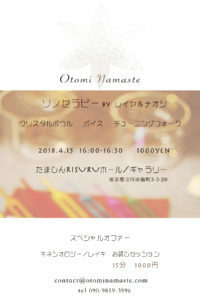 “Otomi Namasté” invite you to the healing summer festival to treat yourself ! * Choose the technic you want to experiment, or take a longer session to get a deeper treatment with many technics together! Leiya is a dancer and a healer since her young age. 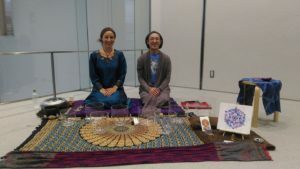 She has been traveling around the world to learn about alternative medicines, spirituality and dance. She has a very good general comprehension of the body functioning thanks to her dancer experience and her anatomy and body care study, a strong intuition, a lot of knowledge to share, and a natural gift that she has been developing since years. Her goals ? Help you to live a happier life, be at your optimal body functioning, and supporting you to rich your goals in life! It is the third project following autumn festival and spring festival. Let’s care about ourself and celebrate the entry in the rainy season! May you have a very special and beautiful day! *Choose the technic you want to experiment, or take a longer session to get a deeper treatment with many technics together! Inside travel with your inner child. 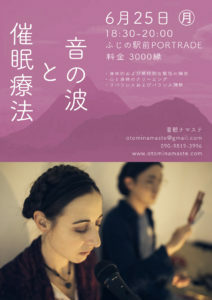 Every monday at Portrade : EMMA’S TIME for kids and parents ! ENGLISH CLASS or FRENCH CLASS in music and stories ! Explanations : come and sit with your kids close to you. 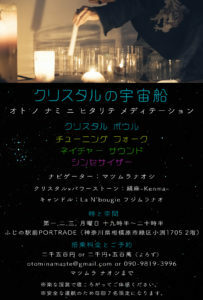 Emma will play some songs, clap in her hand with you, and tell you some funy stories with gestures. This is a nice way to discover another langage and another culture for parents and kids and spend a nice time together. BRAIN GYM in english ! 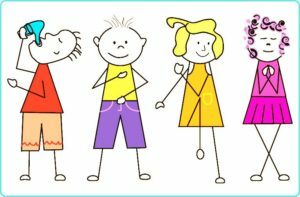 Simple and funy body exercices for a better learning at school. Bring your bottle of water, confortable clothe and be ready to have fun with Emmanuelle ! HOW THIS IDEA WAS BORN ? Emmanuelle has been working at Shirokane-takanawa TAP Plaza for about a year when she came to Japan for the first time on a working holiday visa. She started with some French class “Emma’s Time” using a white board, flash cards, songs, music and books at the mothers and babies/young kids section (0-6years old). The class was successful and the mother appreciated her energetic and happy personality, and her acting skills. Following that, the director of the Shirokane-takanawa library ask her to held some “French book reading time” at the library for kinder garden visiting the library monthly. Then, her activity evolved with the TAP’s team with art craft teaching for elementary school students, sport activities with junior high school students, Halloween day with stamp and make-up, and weekly “English fun class” for 0-6 years old kids. After this job, she got the chance to work in a bilingual Emilia Reggio pre-school as an Art teacher (painting / drawing / sculpting, dance…) for kids from 3 to 6 years old in Tokyo. Emilia Reggio is an alternative approach to education using a lot of arts to help children evolve faster with a lot of fun and respect, always having high expectations to invite them to always go further on their observations and application skills, and respecting and trusting them in their own way. When the “Portrade fairtrade shop” was created, Emmanuelle had the idea to create “Emma’s Time” and shared the idea with Tsuchi, and also add another class with Brain Gym to help kids with their school work, give them confidence, and have fun with simple exercises. 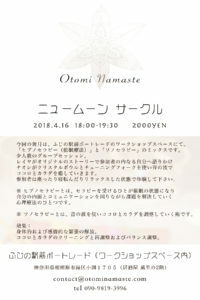 OTOMI NAMASTÉ invite you to a NEW MOON CIRCLE ! Leiya will help and guide the flow of the session, while Naoshi will create a nice sound environment. Copyright(C) 2018 OTOMI NAMASTE All Rights Reserved.